Mostly reviews of fantasy and sci-fi books, oftentimes romantic fantasy and sci-fi, with a little of this and a little of that thrown in for good measure. This was actually my second run-through of Assassin's Apprentice. I remember being more absorbed with the book five years ago, but back then, I blew through the whole trilogy in succession. 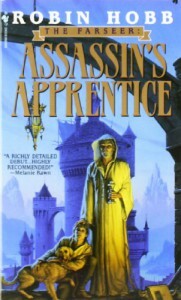 I think that Assassin's Apprentice is better as a part of a trilogy than when analyzed on its own. During this reading (which was actually 1/2 of audiobook listening, 1/2 of reading due to time constraints), I had a lot of trouble connecting with the characters and the world. I think the main reason for this was the first-person POV narrative. Now, I have to warn you - if you've read through some of my other reviews, I pretty much always have the same complaint whenever a book has a first-person narrative, with a few exceptions. So, with regard to my relationship with the book, this might be more of a "it's not you, it's me" thing. But, the fact of the matter is that we miss out on a lot by being stuck in Fitz's brain the whole time, and well, Fitz's brain-prose? Somewhat dull. Now, to be clear, the events/story aren't dull, but Fitz's matter-of-fact assessment of them sometimes is. The other issue I had was that there was no real build-up to anything. Rather than the story building up to one culminating moment, the story seemed more like a compilation of lesser events. That's not necessarily a bad thing, but possibly another factor contributing to my overall sense of detachment from the characters and world. With all that bad stuff out of the way, the book really had its shining moments. The sense of adventure, the world-building, the interesting/unique concepts (the Skill, the Wit, the forged people) - all of these factors blended into a fun, fantasy story. On top of that, I enjoyed the characters. You'll find no Mary Sue or Gary Stu tropes in Assassin's Apprentice. They are (almost all) believable, and you can imagine a real person acting the same as any of the characters in the book if they had been in the same situation and circumstances. I also really love the whole idea behind the book - being an *assassin's apprentice*, I mean. You follow Fitz's journey to see how he becomes said apprentice, what kind of lessons and tasks an apprentice performs (no, you don't just start killing people right away), what skills an assassin needs, and how Fitz ultimately puts some of these skills to use. As a final note, I'd like to say that I really enjoyed the audiobook version, a lot more-so than the dead tree version. I think the air of performance in the audiobook really spruced up Hobb's somewhat mundane prose. In any case, most fans of the fantasy genre will enjoy this book, and it's definitely worth a read, as is the entire trilogy.